23 years, 6 months and 14 days ago Kevin Daniel Williams died from crush injuries at the Hillsborough football stadium in Sheffield. He was just 15 years old. Kevin’s mum, Anne Williams, has spent every single day since then waking up thinking about the Hillsborough disaster. She wasn’t able to grieve properly, because she knew the official version of events was a lie and that her son could have been saved had medical intervention not been with-held. Anne has spent 23 and a half long, tiring years putting in super-human effort to try and to get to the truth about how & why her son died. The truth should have been a basic human right in death, and for Kevin and the other 95 victims it should have been readily available on the day of the 15th April 1989. It wasn’t available, because the South Yorkshire Police were culpable and they lied and covered-up their actions in order to shift the blame from themselves onto the fans. 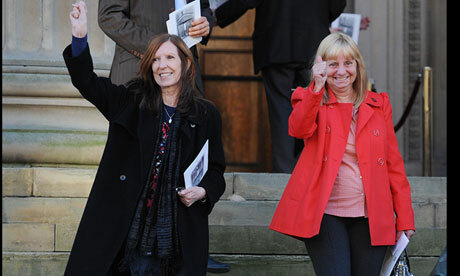 This is a picture of Anne Williams (left) and Margaret Aspinall just after the Hillsborough Independent Report contents was revealed their findings. The truth was out, but the truth is only half of the battle. Next had to come justice. Those who failed in their duty of care, those who lied to shift the blame, and those who perverted the course of justice needed to be held accountable. Justice was the only decent destination to arrive at once the truth was widely accepted. Last week, Anne Williams announced to the world that she was suffering from terminal cancer. A woman who has been forced to spend nearly a quarter of a century campaigning to have her son’s name cleared, and the inquest verdict of accidental death over-turned, announced that she might not live to see justice done. She doesn’t want to know how long she has left so she can enjoy what time she has left with her family.The strength, courage and faith that Anne has displayed over the past 23 years has inspired so many, including myself. Being a dad myself, I don’t know how I would have continued to live, let alone fight in their honour for so long. If you agree with me that it is simply unacceptable that the inadequacies and lethargy of the British legal system should rob Anne of the chance to finally see justice for her little boy before she dies, please, please, please sign the government petition to have Kevin Daniel Williams inquest looked at as a matter of urgency. It will take you less than 2 minutes, and it means so much to a mother who just waved her son off to watch a football match, and as a consequence endured 23 years of hell. Please help. Don’t let Anne be the latest family member to die before seeing justice served for their loved ones. Tagged accountability, anne williams, cancer, inquest, justice, kevin williams, petition, please help. I signed that petition some time ago, but I’m happy to share links to it on my Facebook. I was really distraught to learn that Anne Williams is so ill. Why did that have to happen to her of all people, and why *now*? powerful words Mike. I have been pushing this as hard as I can. I was devastated when I found out last week and it is hard to accept how cruel life has been to Anne as she is so close to gaining justice for Kevin. She has inspired so many people over the years with her bravery and courage. A remarkable woman. Previous Post Wonder if that ‘Leeds fan’ who attacked Kirkland at Hillsborough has any idea what happened in that exact spot, and why? Next Post Hillsborough inquests quashed by High Court today!